Throughout history women have been silenced by the patriarchal system. 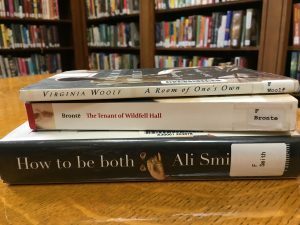 Explore the ways in which female writers have found their voice during “Finding a Voice,” a reading and discussion series at Seymour Library, sponsored by Humanities New York. Dr. Maryanne Felter will facilitate the discussion in this six part series that will focus on women’s creativity in art, literature, and theater. Join us for a brief intro meeting on Tuesday, September 4 at 4 pm. Participants will meet the facilitator, Dr. Maryanne Felter, sign out copies of each book, and receive the syllabus for the reading discussion series. *For participants who cannot attend the intro meeting, books and handouts will be available after September 4 at the library’s main desk. Supplies are limited, so if interested please register by contacting the library at 252-2571 or stop by the main desk to sign up. Participants are encouraged to attend all six sessions. A special thank you to Humanities New York and the Friends of Seymour Library for making this program possible.